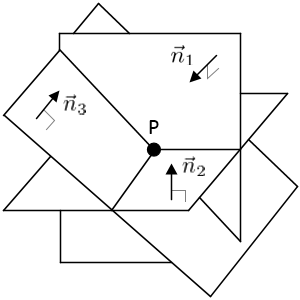 Let the normal vector of a plane, and the known point on the plane, P1. 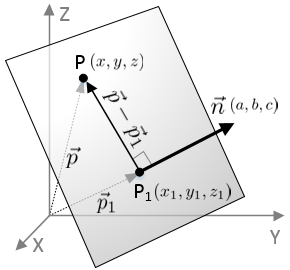 And, let any point on the plane as P.
We can define a vector connecting from P1 to P, which is lying on the plane. 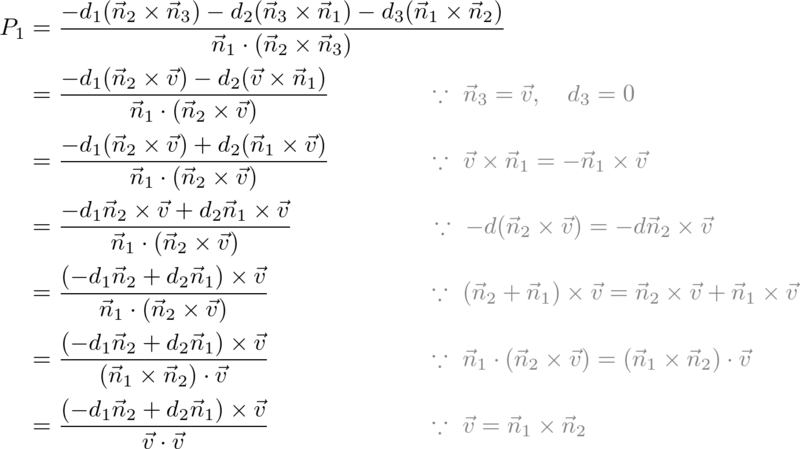 Since the vector and the normal vector are perpendicular each other, the dot product of two vector should be 0. 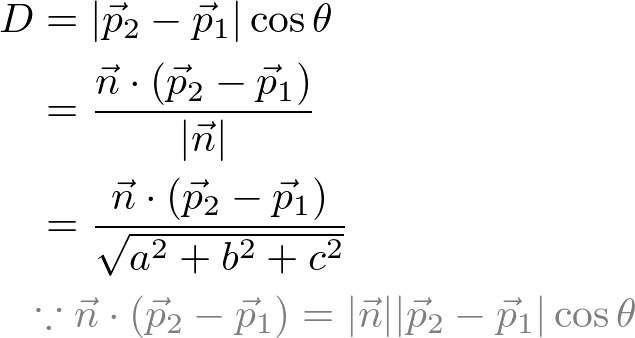 If the normal vector is normalized (unit length), then the constant term of the plane equation, d becomes the distance from the origin. 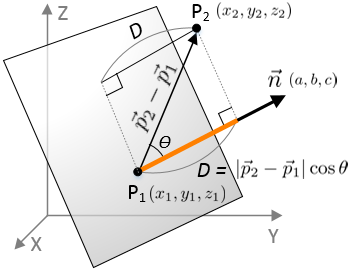 The shortest distance from an arbitrary point P2 to a plane can be calculated by the dot product of two vectors and , projecting the vector to the normal vector of the plane. Notice this distance is signed; can be negative value. It is useful to determine the direction of the point. For example, if the distance is positive, the point is in the same side where the normal is pointing to. And, a negative distance means the point is in opposite side. Before finding the intersection of 2 planes, we discuss finding the intersection of 3 planes first. This formular will be used for 2-plane intersection. There are various ways to intersect 3 planes, but we will look into only special case; intersecting 3 planes at a point. In order to find the intersection point P (x, y, z), we solve the linear system of 3 planes. Therefore, solving the linear system is finding the inverse matrix. Now, find any point on the line using the formula in the previous section for the intersection of 3 planes by adding a third plane. We can pick the simplest plane, which the normal of the plane is and it passes through the origin, . Therefore, the third plane equation becomes or . Once the point on the line is found, we can finally construct the line equation as; . 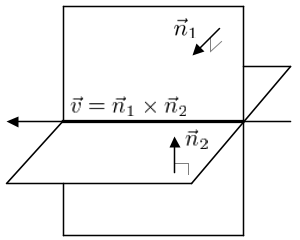 Here is C++ implementation to find the intersection line of 2 planes. Please see Plane.cpp for more detail. 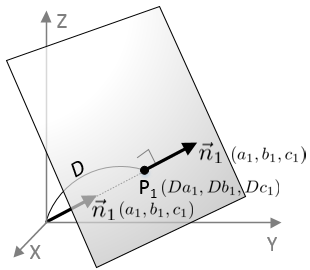 The following interactive demo is finding the intersection line from 2 planes in 3D. Use left mouse button to rotate the view, and right button to zoom in and out. It requires WebGL enabled browsers. You can download C++ version plane.zip.